Poseidon's Tricorne is a crew that sails the Emerald Ocean. The crew currently flies the flag of League of Light. Poseidon's Tricorne was founded on the Sage Ocean 9 October, 2005 by Kneiss and Ravager. The MOST important rule: NEVER leave in Battle!!!!!! You will be demoted, when it happens more than once - and without a really good explanation, you will even be expelled! You will get a yellow card, if this stuff happens once!!!!! That means: you will be noted! Try not to join a Pillage if you have to leave after some minutes. Its only worth of it, when you can stay for more than 2 battles! Never play games or do other duty on a ship than the "pillaging-duty". Senior Officer: After staying fleet officer for some time (or officer for a loooooong time), and beeing an important part of the community, you become a senior officer. 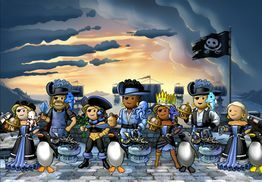 Officers that want to join us from other crews have to start as pirates first! But (if they are good) they can advance faster to the ranks than others! If they seem good enough, we promote them mostly to officers after looking for them for 2 days !!! This page was last modified on 16 November 2013, at 06:40.